You guys have been asking me to review the latest Pixi Beauty products since I announced our on-going collaboration… and I know I’ve neglected you a little! The good news is, I’ve been long-term testing two different skincare ranges from the brand and will be reviewing one today. I’m sure I’ve told you how much I love Glycolic Acid as part of my skincare routine on numerous occasions (normally turning to the Nip and Fab range), but lately I’ve been obsessing over this duo. I know – I said duo, but there are three products in this photo? Well, the Glow Tonic in the middle is simply a liquid form of the To-Go pads on the right, which have been infused with the tonic for convenience on-the-go! One of the best things about the entire Pixi Beauty range is the fact that the products are both Paraben-free and cruelty-free. In addition to this, these specific skintreats include a number of ingredients which are great for treating neglected skin, including 5% Glycolic Acid and Aloe Vera, a great soothing agent to combat the acidity. Perhaps we wouldn’t usually associate a mud-like consistency with a cleanser, in fact, I think if this wasn’t labelled I’d naturally assume it was a mud mask. The good news is, the muddy texture feels incredible when gently massaged into damp skin; I personally like to apply this to remove my makeup with a flannel (making sure to avoid the eye area!). The scent is gorgeous and the product itself leaves the skin feeling intensely detoxed and extremely soft. 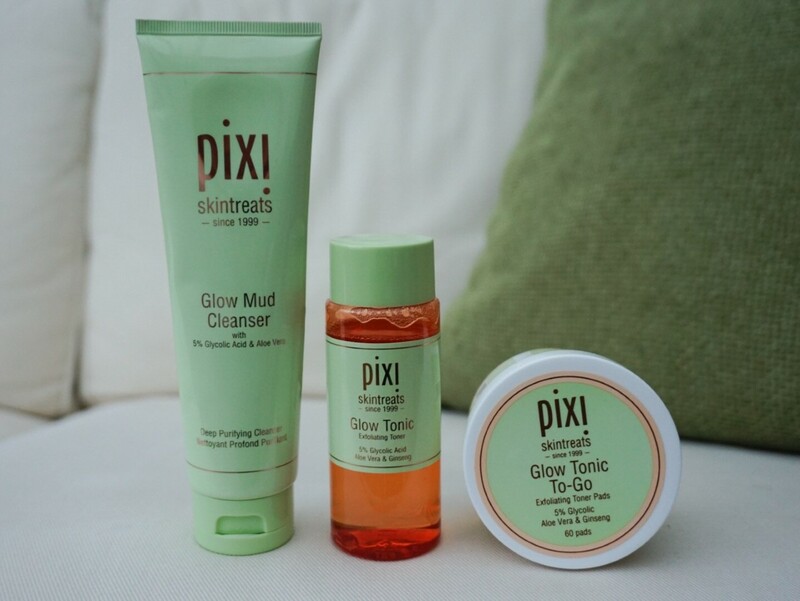 Renowned by beauty bloggers everywhere, the Pixi Beauty Glow Tonic has lived up to all of my expectations. Just like the cleanser, it includes 5% glycolic acid and brightens the skin by removing dead skin cells. Honestly, my skin feels so soften and looks really glowy after applying this combination! And if convenience is one of the most important factors of your skincare regime, the To-Go pads are ready-soaked with this product and come in a really compact pot for travelling! Have any questions or feedback? Leave your comments in the space below! I’ve been trying to try this!! I really want to try out that Glow Tonic! I’ve heard so many good things. Do you think it’d be okay on sensitive skin?